Sizzler is a tricky beast. I’ve been talking it up all summer (and f.y.i., there’s still more than three weeks left). I am one of its only 48 Instagram followers. I also became debilitatingly sick immediately after eating there. And yet even with a dull headache four days later, I still don’t want to snark on Sizzler. Not only is the Forest Hills location just past the never crowded Trader Joe’s that no one ever talks about the only remaining example of this fading heritage brand in NYC, it’s the only sad reminder of the once mighty chain east of Nebraska (if you don’t count the three in Florida, which I don’t). 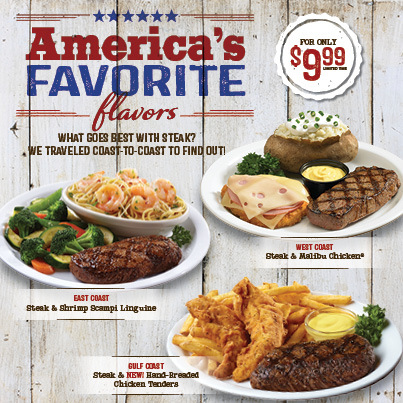 Somehow, though, the America’s Favorite Flavors promotion explicitly mentions the East Coast, represented by steak and shrimp scampi linguine. It’s also kind of a fun bus ride if you happen to be in Williamsburg and enjoy seeing long inter-borough thoroughfares shift character from starting point to near-terminus and keeping tabs on the one other rider with even more staying power. For $2.50 the Q54 provides a magical sightseeing tour of many of the city’s super-scarce chains. Sizzler, obviously, but also NYC’s only Chili’s, hidden in Glendale’s upscale and underwhelming Atlas Park Mall, and one of only two Arby’s, plopped in the lot that used to be occupied by Niederstein’s in Middle Village’s cemetery country. Despite Sizzler searing itself into my consciousness as a child, it’s not a young person’s game. 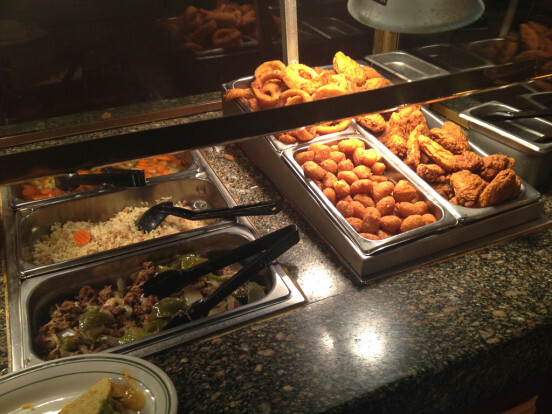 In fact, one member of the crew I convinced to join me had previously been to this exact Sizzler in grade school after her grandmother’s funeral. On this visit I witnessed a septuagenarian’s birthday, as well as waist-high toilet handles, presumably to prevent the need to bend. There are most certainly senior specials, even with the already modestly priced menu. I mean, $12.49 for steak and chicken? 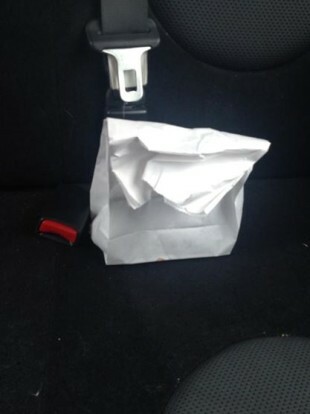 There was no way I wasn’t going to get the Malibu Chicken. I loved Malibu Chicken so much as a teen that I Todd Wilbur’ed it. My sister and I would allocate part of our $20 weekly grocery budget for frozen, breaded chicken patties, Swiss cheese, packets of Land O’Frost ham and powdered hollandaise sauce–just add milk and margarine. We were processed food geniuses. I’m not sure if my tastes have changed or the recipe did, but the sauce currently being served is definitely not hollandaise. The predominant flavor was mustard, not lemon. 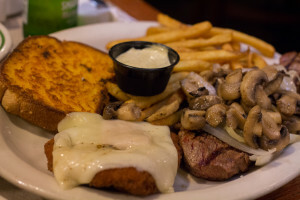 I do now recall the appeal of this dish, though, and it’s the fried, fatty, creamy trifecta. That cheese is a solid molten mass, no lacy holes remain. I would probably add a spicy component if I were an R&D consulting chef. I don’t think Sizzler is at Sriracha level yet, so I might start them off with a mayonnaise-based chipotle sauce. In reality, pepper jack swapped for Swiss might be as much change as anyone could handle. I barely touched my medium-rare steak that sadly didn’t come skewered with a little plastic doneness indicator because the salad bar is more important than sirloin topped with sautéed mushrooms and onions (an upsell). 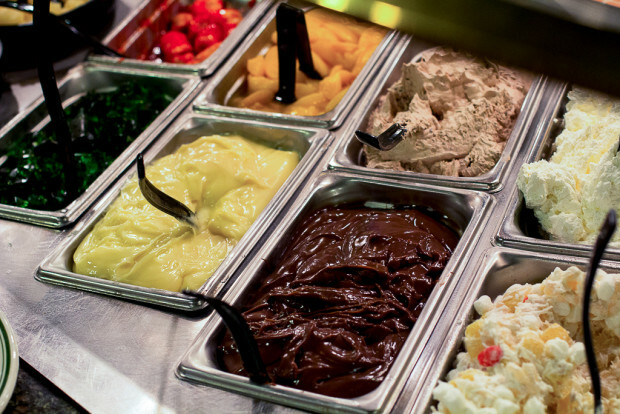 And you’re insane if you don’t get the salad bar–a $4.95 add-on–because incorporating hard shell tacos, krab salad, onion rings, corn fritters, and chicken wings is kind of the whole point. 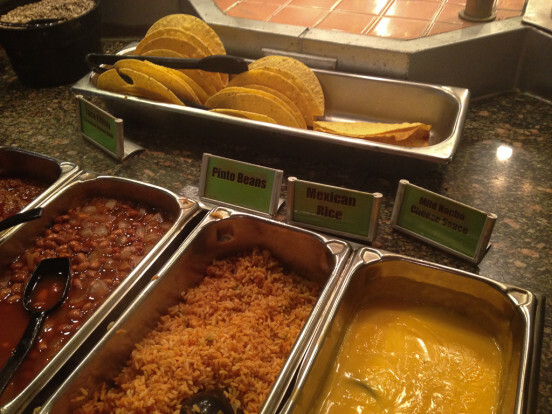 Nacho cheese, of course. Mild, naturally. No shredded cheddar here. I didn’t see evidence of the kale mentioned on Sizzler’s site, but apparently green bell peppers are so out they’re back in. That pile of sauteed beef and peppers is exactly the type of dish that caused so much teen angst that my mom gave up cooking for us. In another fit of Sizzler synergy, The New York Times also featured a pasta salad in its cooking newsletter last week. The soft serve machine may have been broken, but there was no shortage of other soft desserts. 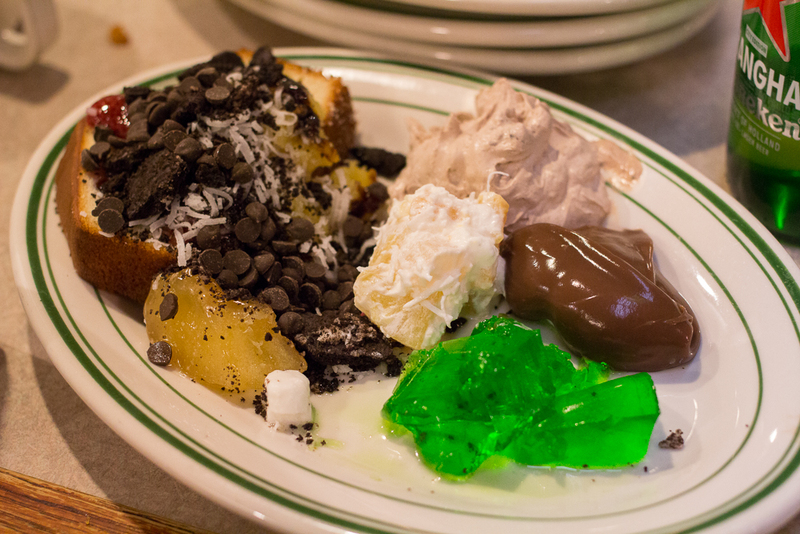 Green Jell-O, of course, plus ambrosia, chocolate pudding, and pound cake hidden beneath an avalanche of mini chocolate chips. 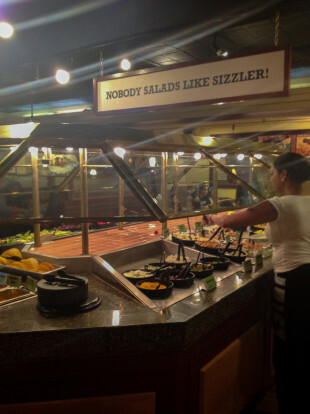 I was going to say that I haven’t been to a Sizzler since the ’80s, but that’s about as accurate as saying the Queens Sizzler is the only one remaining on the East Coast. I must admit I hit one up for lunch when I was in Bangkok two visits ago. 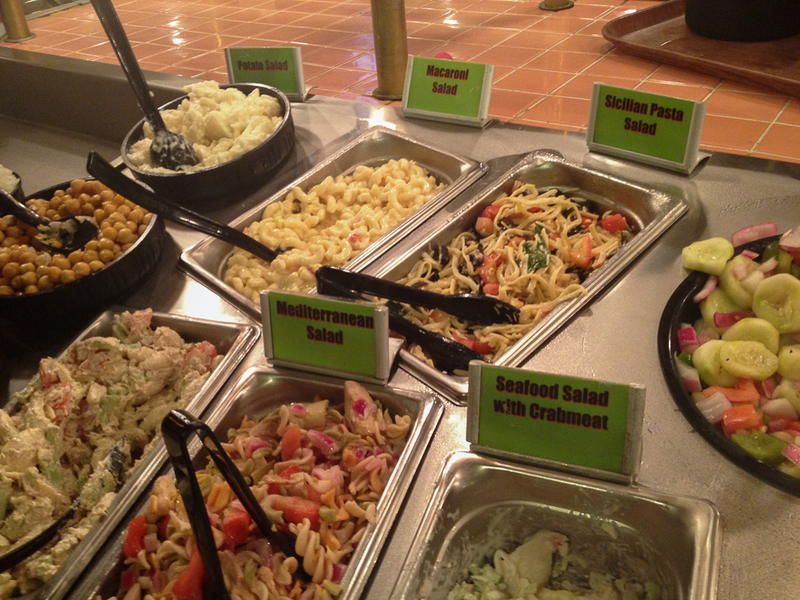 Yes, there’s a salad bar. 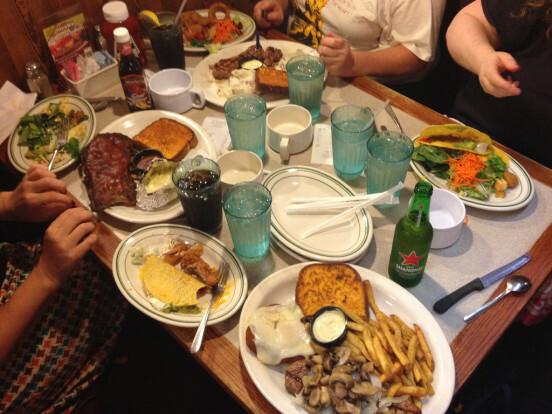 And yes, the portions are completely un-American. You call that Texas toast for two? More like Rhode Island toast, amirite? 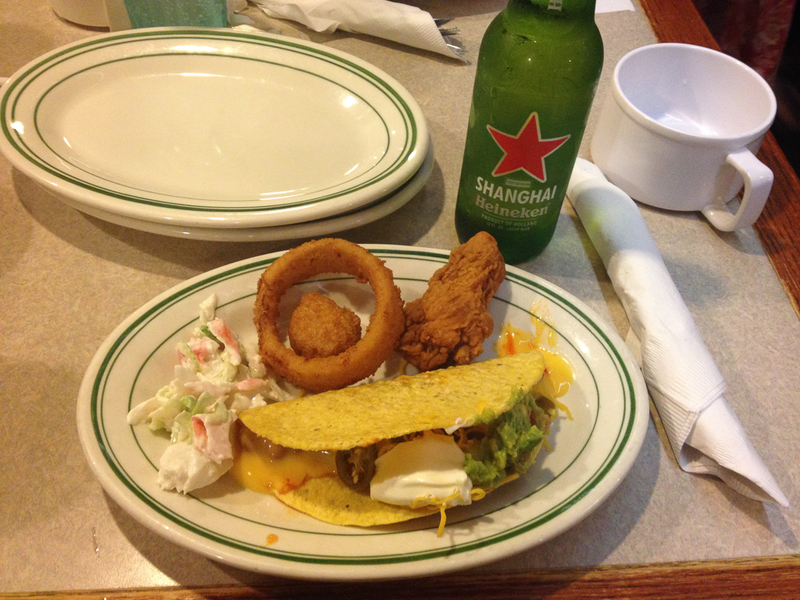 I may have been the only person depraved enough to drink beer at Sizzler. I was also the only one in my group who took home leftovers–steak and Texas toast that got forgotten in my ride half-way home–because I’m just that cheap (and didn’t even pay for my own meal). I’m well on my way to becoming an “Honored Guest.” I only made it down Metropolitan Avenue as far as Ridgewood before hopping out of the car to head off a friend who’d been biking up to meet us for a Forest Hills bar crawl. Too dizzy and sweaty for drinks at this point, I ended up laying down in her spare room, and eventually the bathroom where everything I’d ingested five hours earlier came up for the next 20 minutes. It was only last night that I deduced I had a migraine, not food poisoning–are Jell-O and processed cheese triggers? I got made fun of on Facebook for saying I didn’t want to blame Sizzler, the true mark of an abusive relationship. I can’t have Malibu Chicken to be the source of my malady, and I’m not convinced that it was because no one else who ate it had any distress. Maybe my brain just shorted out from sensory overload–it’s a lot of nostalgia for a body to contain.